Please see the map in the Annex, showing everything important. 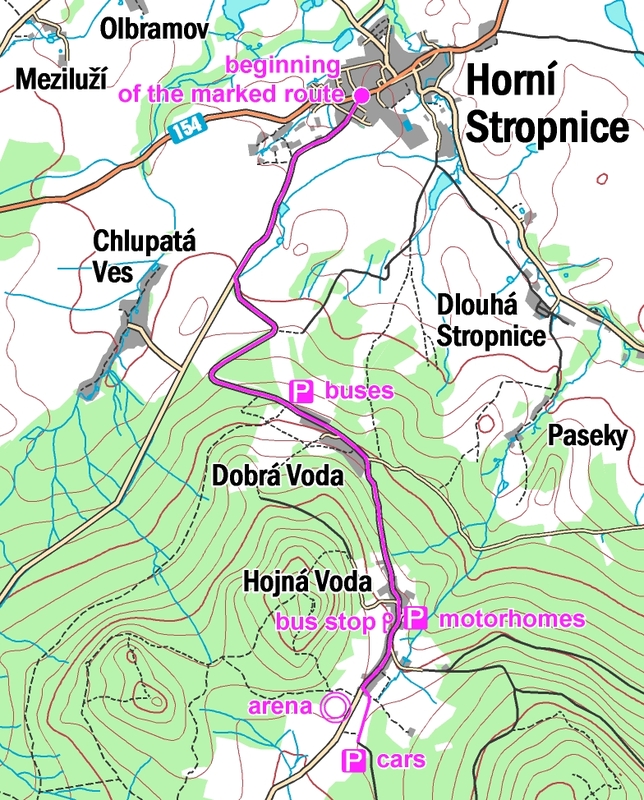 We recommend arriving from the direction of Horni Stropnice. At the end of village Hojna Voda turn left onto local road and follow the instructions of organizers. Meadow near the event arena for 50 CZK/car/weekend. Please follow the instructions of organizers. Electronic system SPORTIDENT is used. In the event arena and in the quarantine. Interim results will be posted in the event arena, final results on the Internet. Online splits will be available at http://splits.racom.eu and also in the event arena via wifi. AP name is „Racom-SPLITS“ and server address „192.168.141.195“. Estimated time of the ceremony is on Sunday at 14.00. All competitors are running at their own risk. The race is held in mountainous terrain. For those having problems with ankles we strongly recommend taping. We also recommend using good quality spiked shoes. Hard floor accommodation in sports halls in Stropnice, Trhové Sviny or Nové Hrady. Ask at the registration office where exactly is your club accommodated. Catering service with offer of hot-meals and drinks will be placed at the event arena. QUALIFICATION – SATURDAY 25. 6. Highland, hilly terrain where detailed rocky areas and steep slopes are combined with fast parts. Visibility varies from good to very poor. There are not many tracks in the area. Attention! There are two starts. The way to the starts is mostly the same and is marked with blue and white ribbons. The forking is visibly marked. Competitors in categories P (public) can start anytime between start time 120 and 210. In the start list they have start time 120. All competitors have to pass through the quarantine because the way to the starts runs through it. Is located on the way to the start and it is also the training area. All competitors of Czech Championships has to punch SI unit placed at the entrance to the quarantine, latest at 12.15. Then they cannot leave the quarantine, they can only continue to the start. All other competitors can enter the quarantine from 13.40. They can leave it or continue to the start. There will be training maps, shelter, water, toilets and place to put off your clothes which you want to be transported back to event arena. It is forbidden to use any telecommunications technology in the quarantine. Competitors of Czech Championships run with start bibs which they receive at the registration office. Competitors are requested to attach the start bib on their chest. Competitors of Czech Championships receive their map (marked with their start number and name) at the starting line. Other categories take their map on the way to the map start. Maps are collected at the finish, then distributed after 16.00. Categories of Czech Championships have control descriptions only printed on maps. Other categories have control descriptions printed on maps and also available in the event arena. 75 min, finish closes at 17.15. Attention! The way from last control to the finish crosses local road. There is minimum traffic and the crossing will be guarded by organizers, but to ensure your own safety, please pay extra caution. FINAL – SUNDAY 26. 6. Highland, hilly terrain where detailed rocky areas and steep slopes are combined with fast parts. Sometimes marhes. Visibility varies from good to very poor. There are not many tracks in the area. The way to the start is marked by blue and white ribbons. Competitors in categories P (public) can start anytime between start time 0 and 120. In the start list they have start time 0. They will be published on Saturday evening on the Internet, in the event arena and in the sports halls. 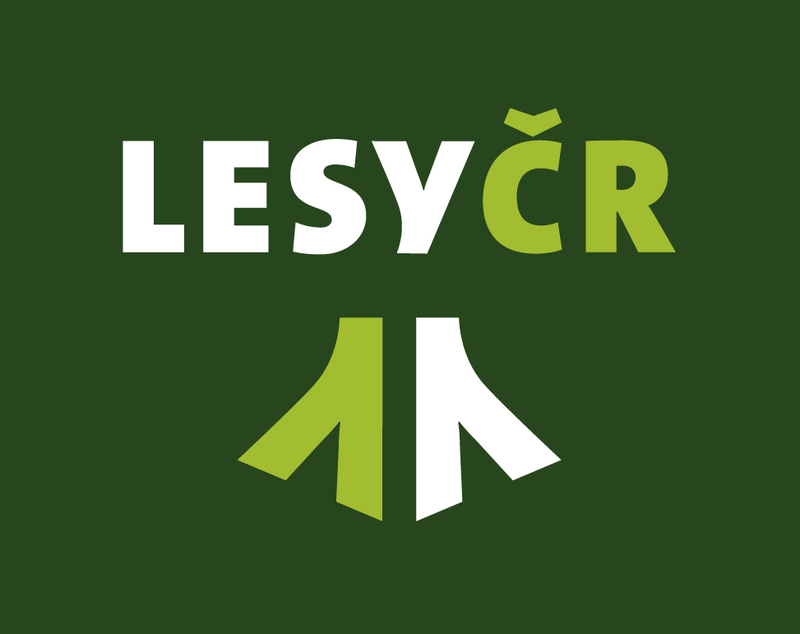 It will also be possible to buy the start list of final „A“ of Czech Championships at the event office. All competitors of final „A“ of Czech Championships has to punch SI unit placed at the entrance to the quarantine, latest at 12.00. Then they cannot leave the quarantine, they can only continue to the start. All other competitors can freely pass the quarantine on their way to start. Competitors of final „A“ of Czech Championships run with start bibs which they pick up in the quarantine. Competitors are requested to attach the start bib on their chest. Selected competitors from categories D21A and H21A run with GPS units which they receive in the quarantine. The list of selected competitores will be posted in the event arena and in the quarantine. GPS units will be collected at the finish. Maps are collected at the finish, then distributed after 13.00. 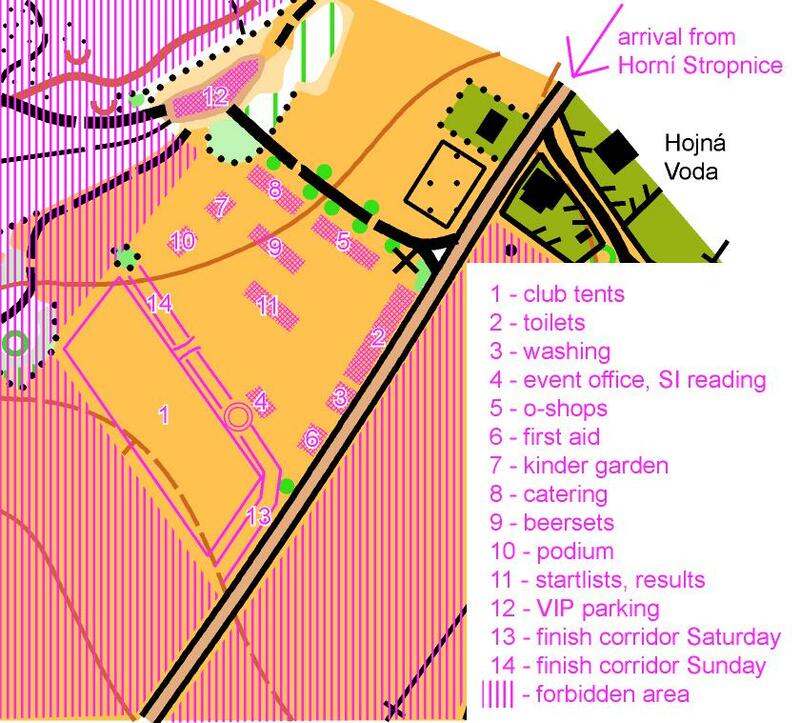 Categories of final „A“ of Czech Championships have control descriptions printed on maps and available at the quarantine. 75 min, finish closes at 14.15. Competitors in categories D21A and H21A are not allowed to carry GPS device with display or sound signal (eg. GPS watch) – according to the rules for IOF WRE races.